Home / Relationships / What you want in Life ? 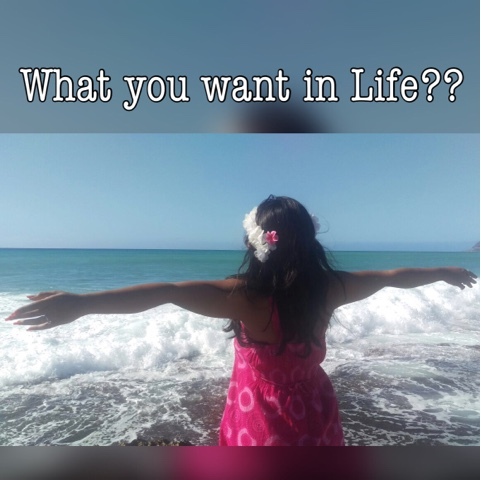 What you want in Life ? I am sure all of you have come across this question many a times. How about this - What you need in life? Aren't both the questions same? If yes, what is your answer or answers ?? Well don't worry this is not a philosophical post where I am going to tell you the answers to these questions. I wish I could, but I don't know myself. I do know I have been asking theses questions to myself since 8 to 9 years now. During school days the answer was easy 'I want to be a Engineer'. Then in college days the specific answer was 'I want to get an Electronics and Communication Engineering merit seat in a good university'. At the end of bachelors course everyone in my class had one dream 'Campus placement'- that is a good paying IT job. I however had personal reasons to not leave my hometown so I modified my answer to 'Stay here and pursue Master's Degree'. I did that along with my gratifying teaching job. After 3 years I was having a Masters degree in Digital Electronics and was working in prestigious university as a Asst. Professor. But as you can guess I needed more from life. All along way I did live my other dreams in parallel like worked as a News Anchor for few weeks, acted in regional television, got shortlisted but didnt make it to finals for popular reality show ROADIES, auditioned for commercial cinema and was selected too for a Tamil movie. Why didn't the movie happen?? Lets save that interesting story for another blogpost. After that my answer was 'To get married to Mr. R, I meant Mr. Right', which I would live to believe did happen eventually. After marriage I entered the blog world and now blogging is like breathing to me. All these years when I answered the question What I need in life? What I want in Life? I mostly concentrated on the professional front. Even though my journey as a Asst. Professor was successful and gratifying I would say Blogging was my true calling. But I believe blogging is a part of my journey and not the only thing I want or need in life now. So the answering still continues but as days pass by it comes more and more difficult to answer the question. Today morning while I was chopping the vegetables I realized something about theses questions. All this while I thought the answer was a constant. Or I excepted it to be a constant. But the truth is its a Variable. I mean what you want or need in life today might seem useless tomorrow. Lets exclude the relationships here and include materialistic things. I also don't mean that once we had achieved what we wanted they mean less, or do they ? I just mean the answer is variable and keeps changing with our experience, our age and in short is just subjective to change. And if no two human beings are the same then for obvious reasons their wants and needs can never be the same. Yet its amazing to see how we all run in the same race trying to win the same prize be it that branded bag, fancy car, million dollar lottery, big mansion, promotion and so on. So the answers to these questions need to be defined individualistically. And I need to accept that the answers are temporary and not for life long. It really is funny how all these different people who need different things are all living such similar lives. We all seem to want the same things and tick all the correct milestones, and I feel like it's society and our complex brains that have felt the need to categorise everything and create a system out of life. Imagine what it would be like if we had no examples before us, no system of life in place, and we simply just lived. Imagine how different our lives would be. We'd just be living off what we need rather than what we think we do. Thats true ! Thanks Ami ! Hey Ananya .. great article. I think there's a difference between needs and wants. Food is a need while success is what we want. And after reading i liked everything about the topic and i will wait for your "Why didn't the movie happened?" Thanks Jaspal, sure I have been delaying too long in writing that post. Guess its time to write abt it now..
To me, wanting and needing are two very different things. But yes, these are questions we often ask ourselves and our answers probably change with time. It's always nice to reflect though. Thanks Jeanne for sharing ur thoughts ! Lolz ... Thanks Archie ! Wow! A beautiful piece !!!! And the best part is when your NEED n WANT r same. As you told, our motivates us and makes us happy keeps changing over the years! I don't believe in popular notions of happiness - Ticking off the several tourist destinations(most of spots would be sold by agencies to make quick buck as one could see once one reaches the destination as operators hurry things off), Leaving a cushioned job for one's dreams (People would either have enough before they do crazy stuff though there are exceptions). I believe in simple joys of life!